Puma lead the Volvo Ocean Race 2011-12 after a dramatic first nine days of the opening leg from the Spanish port of Alicante to Cape Town in South Africa. Long-time leaders Groupama have slipped back to fourth after their decision to hug close to the African coast eventually backfired, while Abu Dhabi Ocean Racing abandoned their restart with a new mast and join Team Sanya in hoping to be ready to resume racing for the second leg starting on December 9th. 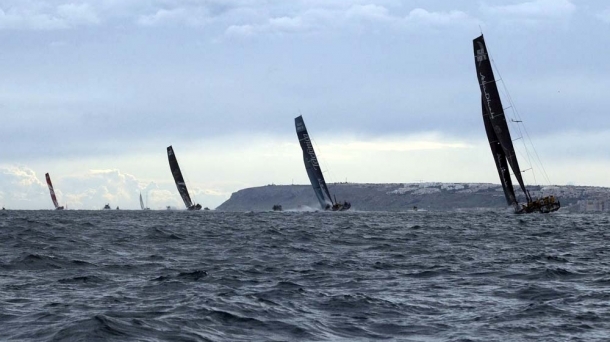 The first week of the Volvo Ocean Race 2011-12 witnessed strong winds, high seas and serious damage to the boats, and hopes, of Team Sanya and Abu Dhabi Ocean Racing. The remaining four boats sailed out into the Atlantic as they continued their voyage from Alicante to Cape Town, and were greeted by calmer seas. At this point, Telefonica and Puma took the decision to head out West in search of the trade winds while Groupama decided to take a more direct route hugging the African coast. Camper initially followed Groupama inshore before opting to cut their losses and heading out west themselves. This change of heart has cost valuable time, leaving them down in fourth place. At least they are on the water while Team Sanya were left to assess the damage to their hull in the Spanish port of Motril. The fleet is expected to reach Cape Town on Friday 25th November, and the crews will then have two weeks to get ready for two days of In-Port racing before Leg 2 to Abu Dhabi begins on 11th December.